The night soon became an endless series of half-hour stretches of sleep – first woken by the cold from the window, then by the heat after the window was closed. Alternately freezing and sweating, I tossed and turned my way through the early morning. The music in the hallways was so loud it penetrated every inch of the accursed train – meaning nowhere to escape. I went back to my compartment, jammed earplugs into my ears, hid my head under clothes and pillows, but still couldn’t escape the blood-curdling screams of the treble. 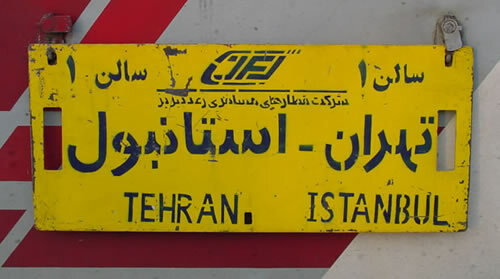 Hours later, my mind dull from the overwhelming heat and the hours spent staring longingly at the passing mountain cliffs, dreaming of jumping from one, the train finally pulled into the next stop – Iranian Immigration.